France in London | Is “French Bashing” legitimate? French Bashing exasperates the French. Nothing annoys them more than an English or American article gloating upon the reasons for the supposed decline of their beautiful country. But we have to ask ourselves the questions: Are the Frogs really that bad? Are we really pampered by a Nanny State spending public money as if there was no tomorrow? 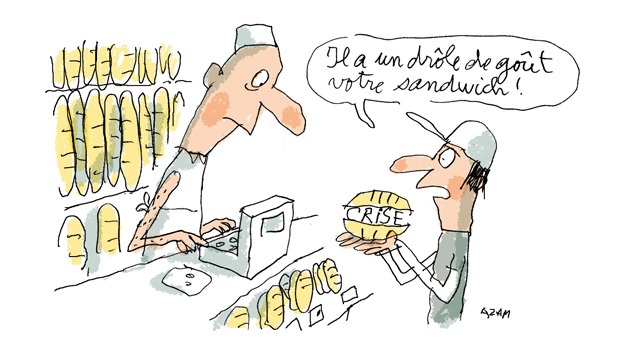 Is French Bashing legitimate? Should the Anglo-Saxons derive as much pleasure from French Bashing as they do from other blood sports like fox hunting? A recent report published by the Court of Audit (the public finance controllers) would tend to confirm the alarmist predictions of the decline of France. On Tuesday 11 February 2014, it said that the government risked missing its public deficit targets by between 3 and 6 billion euros unless it made greater efforts to cut public spending. 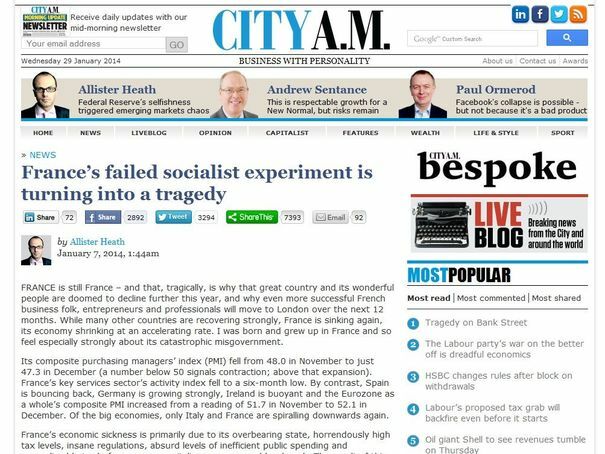 If French Bashing is firmly based in reality, how can we then explain the French ambassador in London’s aggressive response to City A.M., which claimed that what they called France’s failed socialist experiment was turning into a tragedy? Directly attacking Britain’s cherished NHS and allegedly unequal fiscal system was perhaps ill-advised and not terribly diplomatic, but this sudden rage reflects France’s exasperation with continuous Anglo-Saxon mockery. Since France refused to join the U.S. and the U.K. in Iraq in 2003, the Brits and the Americans have portrayed the French as a lazy, anti-capitalist bunch of dreamers, wallowing in their profound decadence. The British magazine The Economist is well known on the other side of the Channel for regularly predicting the impending collapse of the country’s social and economic system. More recently, the American magazine Newsweek wrote about the “Fall of France”, in an article full of factual mistakes and exaggerations that appeared to the French to show both ignorance and prejudice. What the French actually hate the most is being given lessons by countries who, allegedly, are performing so much better, on how they should improve their sluggish economy, demolish their Nanny State and absurd public spending, and learn to live responsibly. Given that the Anglo-Saxon model brought the global economy to the brink of collapse only a few years ago, the moralising tone is understandably hard to swallow. In any event, many French businessmen and politicians are already well aware of the situation, despite what Hollande’s government might communicate abroad. A distinguished economist and historian, Nicolas Baverez has actually already published a book on “The Fall of France”. 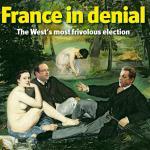 So clearly, not all the French are blind to the issues at stake. As for the French population, they generally share the view of the American expert on France, Arthur Goldhammer, who argues that the Anglo-Saxon press writes sensational articles to divert attention from the internal problems of the their own countries. However, over-reacting in such an aggressive manner perhaps does demonstrate France’s underlying sense of insecurity. French Bashing, even in its often exaggerated form, is perhaps based on a frightening reality that not enough French people are willing to see. 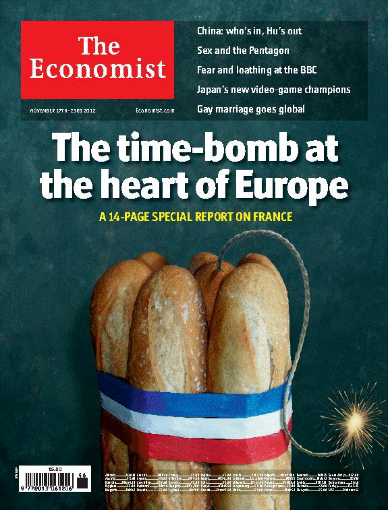 Perhaps this is why French Bashing hurts and leads to severely ruffled feathers, even amongst the ambassadorial ranks. Displaying classic French disdan for the idiocies of the popular press in the U.K. may nonetheless, on balance be better than trying to fight back by knocking the NHS, poor state education in the U.K. its broken social model and the fact that its governing classes that seem unconcerned by a widening gap between rich and poor. “Always forgive your enemies, nothing annoys them as much”. PS Wasn't it the same Oscar Wilde who described English foxhunting as "the unspeakable in pursuit of the uneatable!" ? Something the French would never waste their time doing.............! Let us not forget that France beat the English this year in the 6 Nations rugby tournament, owns most of our water companies and a few power companies(EDF),has world class banking companies and glass making companies (St Gobain & Arc Int),is likely to do better in the Football World Cup in Brazil than England, and has more world class top chefs than Britain,and is more self sufficient in its energy supply than the UK.It owns and runs Eurostar and EuroTunnel making a profit where we failed.Its motorways are magnificent. My daughter was taken ill on a Cherbourg beach a few years back and rushed to The hospital Pasteur hospital where they could not have treated her faster or better,with a five minute wait a few years ago. My elderly mother broke her hip and was also brilliantly cared for by this same hospital two years earlier. decline or fall is greatly exaggerated, it is perhaps coated too heavily in some Hollandaise sauce. Vive toujours la belle France! The Fench ambassador has the diplomatic nerve to call the illegal French Blacklisting of Jersey a spat between tax administrations. Frankly he can stew in his own gravitas.